Retired general and senator Roméo Dallaire delivered a strong message for Canadians at the May 23 screening of the documentary Fight Like Soldiers, Die Like Children: Child soldiers are children, no less so than your own. Directed by Patrick Reed, the film, based on Dallaire’s 2010 book, provides a glimpse into a horrific reality seldom talked about—the strategic use of children as military weapons. The film, which follows Dallaire in Africa in his ongoing mission to eradicate the recruitment of children into armed conflict, was part of the RIDM Docville series at Ex Centris. Reed says he did not set out to make an “activist” film but after reading Dallaire’s book, he saw the potential for something innovative. “In many ways, it takes a soldier to fully understand child soldiers; and it takes a man who was once broken, such as Dallaire, to break new ground, to change the narrative, to engage a new audience,” Reed writes in his director’s statement. Dallaire had never seen action before being sent to Rwanda in 1993 on a peacekeeping mission—during which time 800,000 people were butchered in three months as the world’s most powerful countries refused to get involved. His first book, Shake Hands with the Devil: The Failure of Humanity in Rwanda, was written to explain to his own children why their father came back traumatized and suicidal. It became a first-hand account of the Rwandan genocide and garnered a Governor-General’s Award for non-fiction in 2004. But the faces of the dead were not the only ones to haunt Dallaire. In one of the most gripping moments of the film, he describes looking into the face of a child soldier holding an automatic weapon, whose eyes reflected sheer terror but also an explosive excitement in the context of extreme violence. Though we fear weapons of mass destruction, we should be more concerned with what he calls the “low-technology weapon system” of recruiting children under 18, often by force, into military groups. An estimated 300,000 kids under 18 “work” as soldiers worldwide. They are chosen because there are so many of them, they are not paid, they are easier to control than adults and they are considered expendable. Also, light automatic weapons that have proliferated since the Cold War can easily be handled by youths. including brainwashing, drugs, being forced to commit atrocities sometimes against their own families, and through physical and sexual violence. ostracized. In the film, animated segments narrated by a former child soldier tell part of the story. His writing is not therapy, Dallaire says. It is a painful reliving of unbearable memories. “When I work with kids, it does not heal what I saw,” he says. What keeps him going is the belief that he can find a solution, though he says it could take 60 years. He urged the audience to get involved, to email elected officials demanding they do more. t genocide and human rights. “Does this country recognize that all humans are human?” he asks. Canada, one of the most powerful nations, must recognize its capacity to react to prevent, not just resolve. Fight Like Soldiers is in theatres, including the AMC, with English subtitles. To confirm showtimes, visit cinemamontreal.com. To learn about Dallaire’s Child Soldiers Initiative, visit childsoldiers.org. 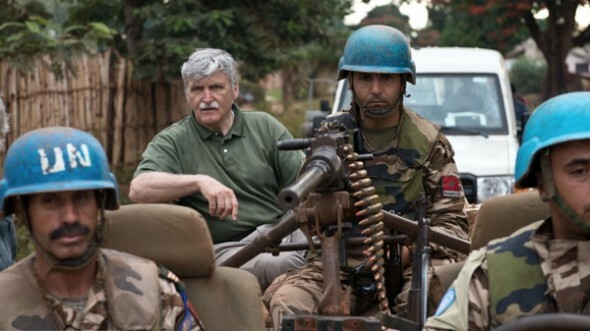 Be the first to comment on "Child soldiers: Romeo Dallaire, once broken, breaks new ground"